Did you plan enough time for all your wedding photos? Planning a wedding is a huge task and it can be difficult to estimate how much time things are going to take throughout the day. Most couples will get advice from friends or relatives who recently had their own weddings on how to estimate times and create their wedding day timeline. Many times I am so disappointed when I learn that the “Formal Photography” portion of the day is just about one hour long. Typically this is the time between the end of the ceremony and the start of the reception and most often is only 60 minutes, especially when the ceremony and reception are in the same location. Well, that may be 60 minutes on paper, but it never works out that way in real life. See, in order to get that full hour that is allotted on the timeline, there can be no deviations whatsoever. This means no receiving line. No distractions. No talking to anyone after the ceremony. No bathroom or smoke breaks. No eating or drinking anything and everyone must stay together until all the photos are done. Any deviation from this will throw off the timeline and this time loss must be recovered somewhere. Unfortunately, the time lost is often recovered from what was originally allotted for the formal photo hour. In order to create a full series of beautiful, artistic and story-telling images of your wedding, we need time. More than just 10 or 15 minutes. Let’s not even factor in if we are creating a video as well. Those wedding films that you see us create, take time to create. Just like in Hollywood, we need to film sequences and sometimes, filming those sequences will require a “Take Two” or “Take Three” if they didn’t come out just right. Ideally, it would be amazing to have Two Hours to photograph all of the formals. This may seem like a lot of time, but it really isn’t. Those couples that do give us this time end up with lots more beautiful, creative and artistic photos and they are so happy they did. You wouldn’t plan such an important day, invest so much money and pay so much attention to all the details, without allowing enough time for photography or video, would you? Just remember… after your wedding is over, all you will have left is vague memories of the day, your wedding rings, photos/video and perhaps a wedding album. We want to be able to capture you at your best and create beautiful wedding album designs like this one shown. In order to do this, we need time. The more time we have, the better. When planning your wedding day, be sure to factor-in enough time for photography and/or video! As some of you may know, this year we celebrate our 10th anniversary in business. We have been extremely blessed over the last decade with lots of great clients, new found friendships and we have been doing a lot of reflecting on the past ten years. 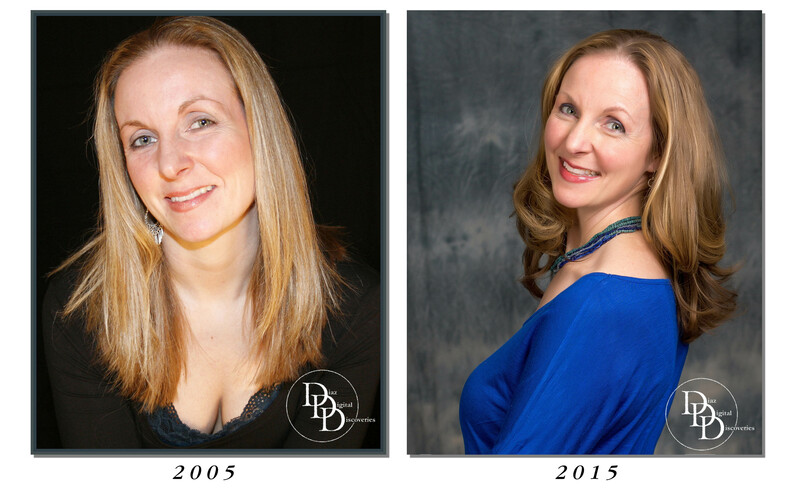 I still can’t believe that it has been that long since I made the decision to create my photography business. I can vividly remember how scared I was, putting myself (and my work) out there for the whole world to see and judge. It has to be one of the scariest/bravest moments in my life. Were it not for all the support I received from my wife, friends and family, I never would have done it. I owe a great deal to all of them! 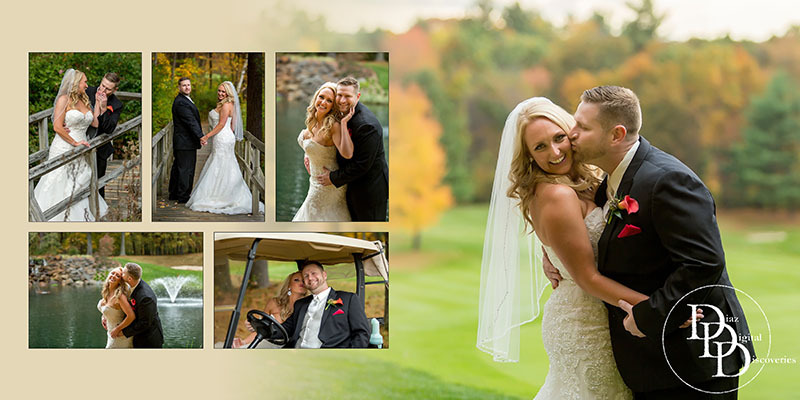 Throughout the years of creating portraits and photographing many, many weddings our growth came about slowly I think…sometimes even unnoticed, over the weeks, months and years. In order to see how much I have grown and what I have learned, I decided to conduct my own experiment. I decided to compare “apples to apples”, so to speak. My very first client (victim) was Jennie, pictured above. She was very instrumental in helping me from the very beginning. She was extremely patient with me as I struggled with learning posing, lighting and all the technical aspects of photography, at the start of my career. I am eternally grateful to her for this! After serving her time as my victim, I then photographed Jennie’s boudoir session. I like to think that it was those boudoir photos, that were responsible for the future events in Jennie’s life…that’s my story and I’m sticking to it. Fast forward…over the past ten years, I have had the honor and pleasure to photograph Jennie’s engagement session, her wedding, her maternity session, her first baby, her maternity session (2nd child) and we are currently working on photographing the baby #2 stages. Over the years, she has been one of our most valued VIP clients and we have also grown to be good friends. To celebrate our 10th year in business, I called upon Jennie once again and asked her if she would be willing to come in for a session. I explained that I wanted to see if had learned anything in the last 10 years and that I was going to use the photos from her 2005 session to compare them with current ones. Without hesitation she agreed to come in. That’s why I think she’s so amazing. She is always so willing to help…no matter what. Well, I’m happy to say that after comparing the photos, I am very happy with the results and more importantly, so is Jennie. I think to look at progress is an important step in the learning process. Sometimes we move so fast in life that we forget to stop and take a look back. It was a fun experiment and I’m glad I did it, because now I have new energy to move forward in my career and continue perfecting my craft. Let’s see how much more I can learn in another ten years.